This cool coast of Cornwall has a perfect blend of swooshing blue waves to surf on, the soft sand to dig your feet under, regular festivals to get your blood pumping and a touch of greenery in the background to create the perfect mix for a great day out at Fistral Beach. This beach is well known for its surfing advantages. Each surf board compliments the waves. You can buy all the equipment you need right there on the beach. There's a surf school if you want to start learning and group lessons if you want to try it with your friends. 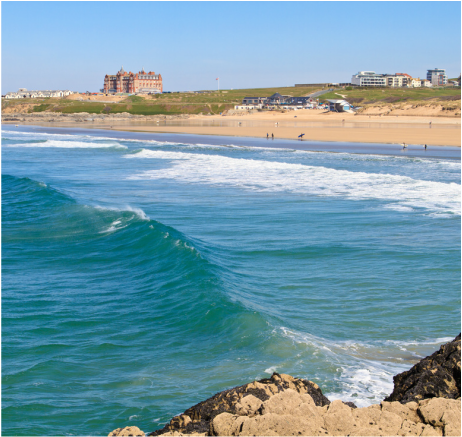 If you're thinking this beach deserves more than one day of your time, there's the Fistral Beach Hotel or other hotels nearby which will help you relax, enjoy yourself with this beautiful beach on your doorstep. Dorset's swirling arc creates a sight of relaxation and bliss at Weymouth Beach. ​The golden beach sand between your toes and the deep blue sea makes it another great spot for a little dip, some tanning and building sand-castles with the kids. It is only a few minutes away from the town centre of Dorset where you can visit historic landmarks as well. This three mile beach is a perfect location to bond with your family or simply walk your dog in the quieter seasons. Set in Swansea, Rhossili Bay was voted Britain's best beach by Trip Advisor for two consecutive years, and there is definitely a reason why. In fact, it is named the 9th best beach in the world. So obviously you don't need to travel all the way to the Caribbean for the perfect beach. The green landscape along with the bright blue sea bring each other out perfectly to create this crisp and wondrous beach. Wales' hills and mountain tops peek across the outskirts of the beach, creating a sense of bewilderment and complete serenity. 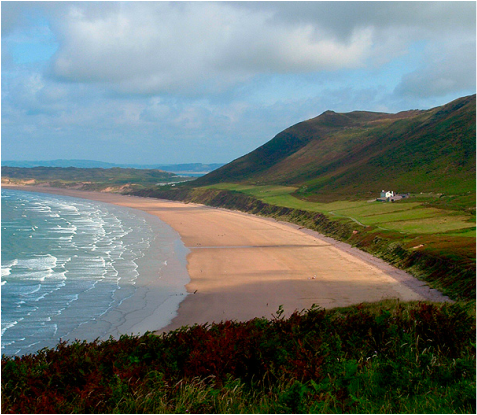 This dog-friendly beach is situated near the small village of Rhossili. And its description won't be enough to prepare you for the phenomenal view you'll encounter. Hotels may be a little farther away, but it's certainly worth the walk. 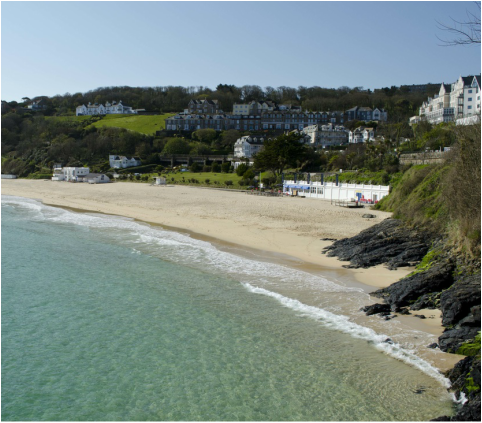 Not only do you get clear, blue water and a sandy beach, but pasta, fish and vegetarian food can fully complete your day out at Portminster beach. The cafe situated on the beach will be that perfect companion. Sticky toffee pudding or a nice glass of wine at a table on the beach will relieve all your stresses away. You can find a hotel nearby and start planning your holiday. 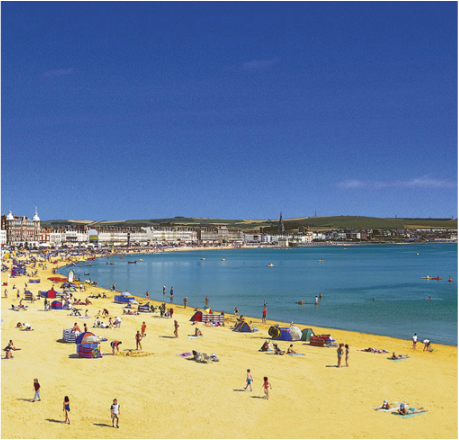 This Cornwall beach will have you enjoying yourself with your family and friends, while seeing children make sand castles. You'll also enjoy the unforgettable view of the horizon. That magnificent sight spreads from St Ives all the way to the Godrevy Lighthouse (which was the inspiration behind Virgina Woolf's 'To The Lighthouse'). 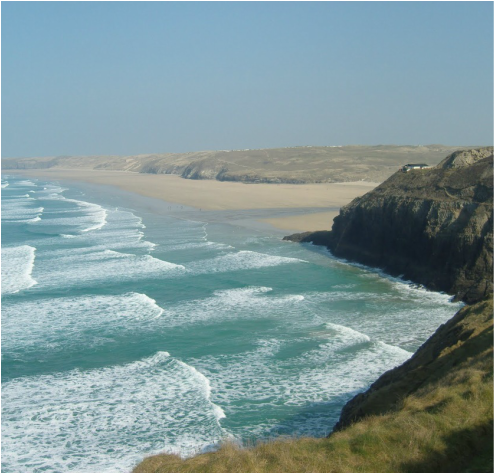 In another part of Cornwall, excellent water quality and a magnificent scenery is available for you to enjoy at Perranporth Beach. ​Rocks reigning across the Perranporth Beach creates a sense of power and magnitude. Give this beach a try, especially if you're easily inspired by the scenery surrounding a bright blue beach. The archetypal town across the beach is also available and most facilities are close to the town, so nothing will be too far away. The large spread of sand will give you the impression of a desert-like environment, with sandy hills curling across the entire beach. ​Find a hotel nearby and plan a day out with the family or your partner. This is another great beach to breathe in the salty air, refresh your body and mind, and have a little splash in that coral water.